In order to keep losing, you need to follow the 4 Day Off the Military diet plan, which is a typical 1500 calorie diet. One of the things I like best about this diet plan is thе possibility you have to pick and choose your daily menu from a huge list of different delicious meals. From the menu items, listed below, you must choose one breakfast, one lunch, one dinner and two snacks. 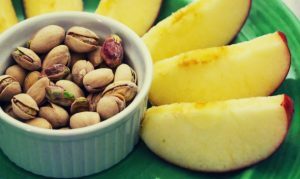 This whole daily menu equals approximately 1500 calories, which is the daily calorie intake for this diet plan. 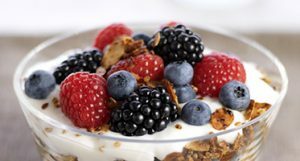 You have it all from cheerful fruity breakfasts like smoothies and yogurt parfaits to waffles, cheesy omelets and whole grain toasts with tomato and avocado slices. 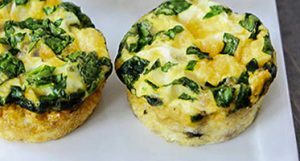 I know toast and English muffins are favorite breakfast to many, so we’ve got 3 different whole wheat toast recipes and a toasted English muffin with spinach and eggs topping. Prep: Blend in a blender. Serve: Layered in a bowl. * Optional – eat only if you want. Prep: Cook oats with milk and apple. Use walnuts and cinnamon for topping. 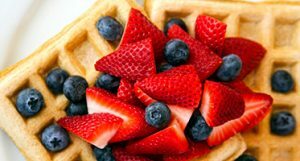 Prep: Make waffles and top them with berries. Prep: Scramble eggs and spinach and eat them on top of toasted English muffin. Prep: Make two egg omelette and top with grind cheddar. Prep: Mix cream cheese and salmon and top the bagel. Add tomato, cucumber and onion to finish the topping. Prep: Cook scrambled egg in butter. Use as toast topping with added tomato and avocado. Prep: Mix almond butter and pear. Use as topping for the toast. Prep: Top the toast with cheese, tomato slices and basil leaves. 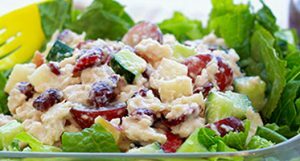 Mix 2 cups of spring greens, 3 ounces of tuna, 3 tablespoons of walnuts, and 1 cup of grape tomatoes cut in half. Add 2 tsps of balsamic vinaigrette as dressing. Mix 1/2 can of tuna with 1/4 cup white beans, 1 teaspoon of olive oil and 1 teaspoon of lemon juice. Serve in a 4 inch whole-wheat pita with 2 leaves lettuce. Eat 1 cup of grapes on the side. Mix 2 cups lettuce, 1 cup chopped raw vegetables, 1 hard-boiled egg, 2 teaspoons of raisins and 2 teaspoons of almonds. Top with 2 teaspoons of balsamic dressing. Stuff 1 piece of whole wheat pita bread with 1 ounce feta cheese, 1 cup of tomatoes, 6 olives, 1/4 cup hummus and 1 cup raw spinach. Use 1 teaspoon of olive oil and 1 teaspoon of lemon juice for dressing. Eat 1 cup of lentil soup with 1 slice of toasted whole wheat bread topped with 1 teaspoon pesto, 2 tablespoons shredded mozzarella and 1 tablespoon chopped sun-dried tomatoes. Stuff 1 whole-wheat tortilla with 1/3 cup shredded Cheddar, 1/4 cup black beans, 1/4 cup each sliced peppers and mushrooms, sautéed in 1 teaspoon olive oil. Serve with 1/4 sliced avocado. Mix 3/4 cup of black beans, 1/4 avocado, 1 cup of romaine lettuce, 2 tablespoons of salsa. Wrap this stuffing inside 2 whole wheat tortillas. Eat 2 slices of whole grain bread with 1 teaspoon Dijon mustard, 5 slices of turkey, 1 pear sliced, and 1 slice of Swiss cheese. Mix together 1 cup diced and cooked chicken, 2 tablespoons balsamic vinegar, 1/4 cup chopped scallions, 1 stalk of chopped celery and 1 cup of salad greens. 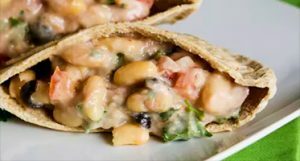 Stuff inside a whole wheat pita and enjoy your lunch. 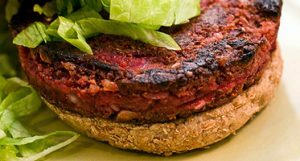 1 black bean burger cooked with 1 tablespoon BBQ sauce, served in a whole wheat bun. 1 tablespoon apple cider vinegar with 2 tablespoons of olive oil. You can eat the slaw in the burger or on the side. Saute 2/3 cup of sliced chicken, 1/4 cup scallions, 2 tablespoons of peanuts, 1 tablespoon hot sauce and 1 cup of shredded cabbage, broccoli, cauliflower and carrot mix in cooking spray. Wrap all this in 2 whole wheat tortillas. Sprinkle 1 teaspoon dried Cajun seasoning on 4 ounces of chicken breast and bake or grill. Saute 1 clove of garlic, 1/2 cup chopped onion, 1 bell pepper in 2 teaspoons olive oil. Add 2 tablespoons of tomato paste and a few sprinkles of Tabasco sauce. Add 3/4 cup of precooked brown rice. Serve: Chicken on top of the rice. Saute 4 ounces of chicken, 3 cups of baby spinach, 2 teaspoons of olive oil, and 1 garlic clove. Put all this on a piece of whole grain flatbread, topped with 1 ounce goat cheese. Cook 2 ounces frozen or fresh shrimp with 1 clove of garlic, 1 cup chopped zucchini, 2 tablespoons chopped fresh basil and 1 tablespoon of olive oil. Serve: on one cup of whole wheat pasta noodles of your choice. Saute 1 cup cooked brown rice, 1 tablespoon sesame oil, 1 tablespoon soy sauce, 1 garlic clove and 1 tablespoon grated ginger. Add 3 ounces of precooked shrimp and 2 cups of bok choy. Cook 1 cup bell peppers, 1/2 small onion and 1 tablespoon olive oil. Spread 1/2 cup refried beans on 2 whole wheat tortillas. Finish topping with sauteed vegetables and cilantro. Saute 1 cup chopped zucchini, 1/2 cup black beans, 2 teaspoons olive oil and 1 teaspoon of cumin. Place mixture on 2 whole wheat tortillas, sprinkle with 1/4 cup shredded cheddar. Fold in half and cook in a pan until the cheddar melts. Top with 2 teaspoons of salsa. 1.5 cups of warm vegetarian chili topped with 2 tablespoons of chopped scallions, 8 broken tortilla chips, 2 tablespoons shredded cheddar. Side salad: 2 cups mixed greens and 1 tablespoon Italian salad dressing. Top a whole grain flatbread with 3 tablespoons spaghetti sauce, 1/2 cup canned artichoke hearts, 2 tablespoons parmesan cheese, 1/4 cup mozzarella and bake for about 10 minutes. Side salad: 3 cups mixed greens, 2 tablespoons pine nuts and 2 tablespoons of Italian salad dressing. Top a baked potato with 1/2 cup of turkey or vegetarian chili, 1 cup cooked broccoli and 1/4 cup shredded cheddar. Saute 1 sliced italian sausage, 1 garlic clove, 1/2 cup chopped mushrooms, 1/2 cup chopped onions and 1/2 cup chopped zucchini. Add in 1/2 cup spaghetti sauce to warm and serve over 3/4 cup of whole wheat pasta topped with 1 tablespoon grated parmesan cheese.